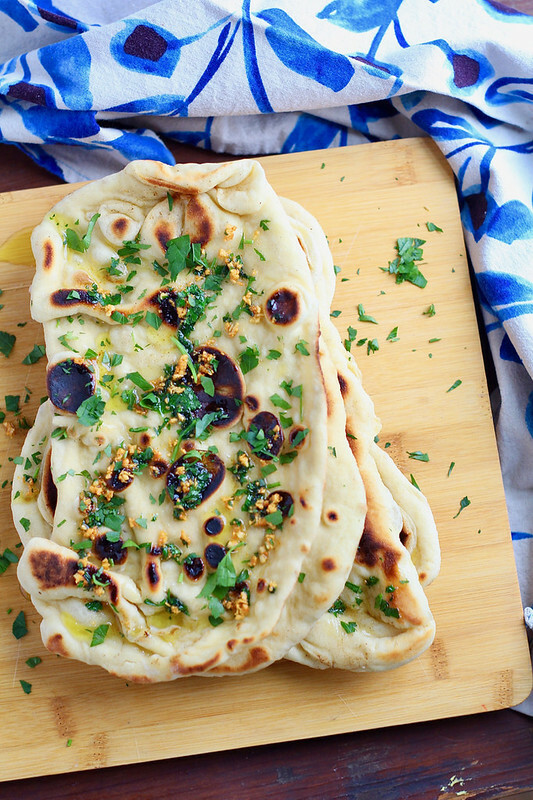 This recipe and the recipe that goes with this naan is something I am incredibly excited about. I have dived head first back into baking and cooking. I have been so excited to finally have the capacity to bake again. I fell off the bandwagon for a couple of months due to many things going on in our lives. But now, I am back into the full swing of things. And it helps that the weather has finally broken (fingers crossed it’s for good) and Spring is officially here! There is something incredibly rejuvenating about warm weather, the birds singing their spring songs and the first signs of spring bulbs poking through the ground. It’s almost like “ahhh yes, I made it through another winter and living things do exist!” The warm sunshine is definitely a motivator. But anyway. 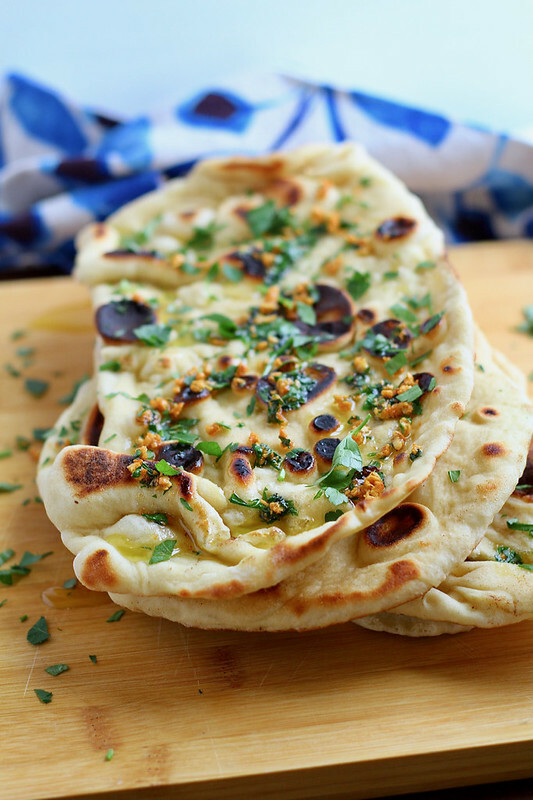 Let’s talk about this fluffy, amazing naan. If you know me personally, you’ll know that I am all things curry lover. I have been making curry a lot this winter. It has almost replaced soup frequency! So, with curry comes flatbread. Obviously. I have been making the same flatbread for ever. I love it because it has few ingredients and it comes together fairly quickly. So, when I first came across this naan, I was like ehh, that’s a lot more ingredients and time invested. But then I convinced myself that it was a least worth a try. Boy, oh boy. It was well worth it. Yes, these do take some time, but you won’t regret it. Make a double batch and freeze the extras. My oldest daughter loves to help roll these out and flip them in the pan. Having a helper makes the time go by a lot faster. Give this recipe a try and you’ll want to make this as a dipping vessel for everything. In the bowl of a stand mixer, combine the water, honey, and yeast. Let sit for 5-10 minutes to activate the yeast. Add the milk, yogurt, flour, baking powder, baking soda, and salt. Using the dough hook on low speed, mix until the flour is completely incorporated, about 4 minutes. The dough should be slightly sticky. Turn the dough out on to a lightly floured work surface. Knead into a ball and place in a large, greased bowl. Cover the bowl with plastic wrap and let sit in a warm place for 1 hour, until doubled in size. When ready to cook divide the dough into 8 equal balls. Using a rolling pin, roll each piece of dough into a large oval, about 8 inches long and about 1/4-inch thick. Meanwhile, heat a large cast iron skillet over medium-high heat. Melt 8 tablespoons butter in a small saucepan. Brush both sides of the naan with the melted butter. Place the naan in the hot skillet, immediately cover with a lid and cook for 2-3 minutes, until bubbles form and the bottom is golden. Flip and cook, uncovered for another 1-2 minutes, until large toasted spots appear on the underside. Remove from the skillet and wrap in a clean kitchen towel. Repeat with the rest of the naan, keeping them wrapped in a towel while you work. To make the garlic herb butter, melt the remaining 4 tablespoons butter with the crushed garlic until the garlic is golden. Remove from the heat and stir in the herbs. 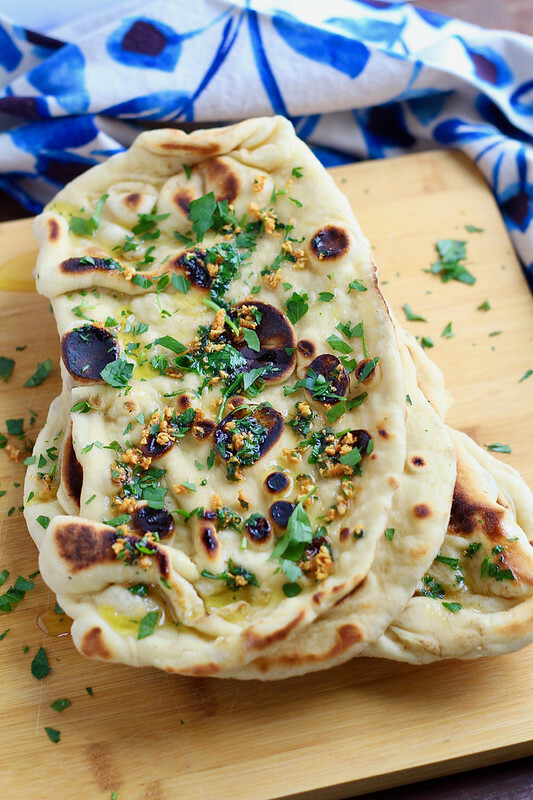 Brush the garlic herb butter over the warm naan and serve immediately. If not serving immediately, brush with garlic butter right before serving. If freezing, let cool after cooking and store in a freezer safe bag. Thaw on a rack, then brush with garlic butter right before serving. Store in the refrigerator for 3 days or in the freezer for several months.